Bob “Dr. Mac” LeVitus has been making his “East Coast Mac User Group Tour” for many years, but this year, he’s coming to DC for the first time! 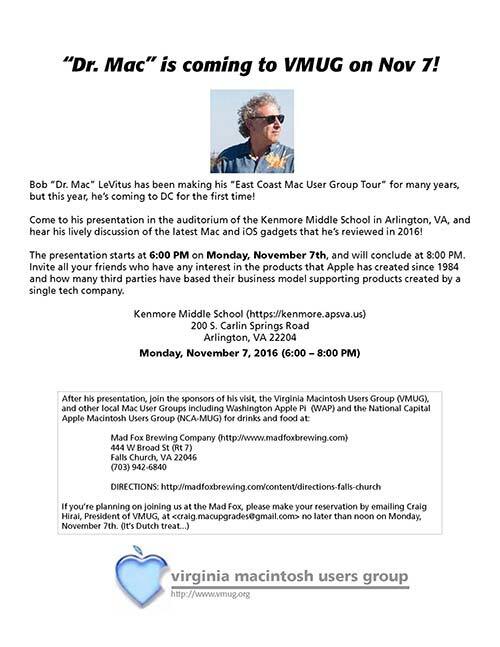 Come to his presentation in the auditorium of the Kenmore Middle School in Arlington, VA, and hear his lively discussion of the latest Mac and iOS gadgets that he’s reviewed in 2016! The presentation starts at 6:00 PM on Monday, November 7th, and will conclude at 8:00 PM. Invite all your friends who have any interest in the products that Apple has created since 1984 and how many third parties have based their business model supporting products created by a single tech company. Click image to download a brochure.